When you start working with Windows Azure IaaS offering, you quickly realize that the age old ways of dealing with infrastructure configuration immediately becomes invalid. Let me give you an example: when you setup a new server in your datacenter, one of the first things you do is acquire an IP address from your network. It doesn’t matter how, maybe just a simple ping test to see which IP is available, maybe from that spreadsheet you have to keep track of used and usable IP addresses, or an IPAM deployed on your network. Well, in Windows Azure, you can’t do that. You see, Windows Azure has to know which IP it has allocated to which VM. It’s only when Windows Azure allocates an IP address to a VM, it actually becomes routable IP in Azure fabric. You can’t reach an IP you decided to assign to a VM yourself! This creates a great challenge when you have to shut down a group of VMs for one of many reasons. If you have created virtual network within Windows Azure, you atleast have a workaround. Start VMs in same order every time (i.e. DC, ADFS, SharePoint and so on). As long as you maintain that order every time, you will notice that IP addresses are allocated in same order from your associated virtual network. However, this poses a great challenge. You must strictly adhere to a routine and that may add more time to respond to a requirement to bring a service online quickly. Well, not anymore! With February 2014 release of Windows Azure PowerShell, new cmdlets are available that will allow you to manage static allocation of IP addresses from your virtual network in Windows Azure. I am having very hard time finding related article from Windows Azure team that talks about this feature. If I was them, I would be shouting it from rooftops! For you detail oriented minds, the Windows Azure PowerShell version should be 0.7.3.1 or higher (yes March 2014 update is already available and version reads 0.7.4). So let me show you how you can actually allocate a static IP address to a VM in Azure. First things first, make sure you have a virtual network (VNet) created. 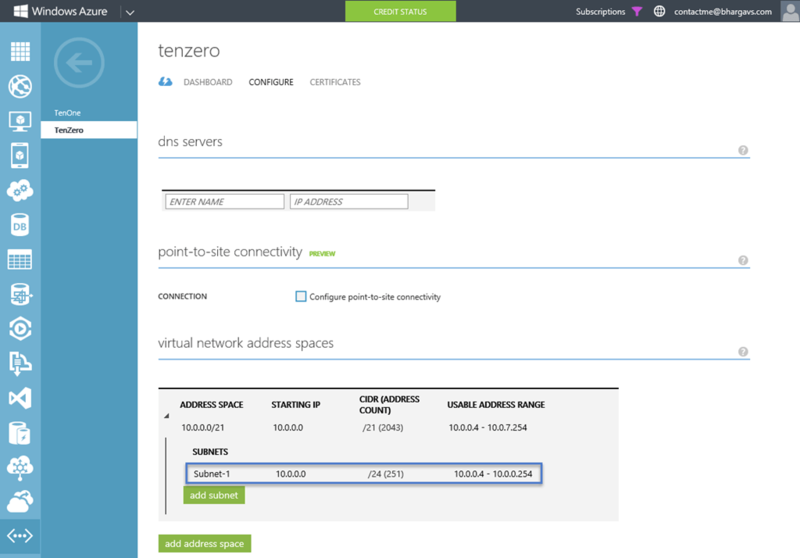 For Example, I have created a VNet called “tenzero” and have created a subnet… “10.0.0.0/24”. Update-AzureVM is important as the changes won’t be committed without it. It’s also important to note that when you run the cmdlets mentioned above including Update-AzureVM, it will restart your VM so be prepared to lose connectivity and if it is in production plan ahead! With all that said and done, let the VM start and you will have VM running with your allocated “Static” IP! Remember, nothing changes inside VM. It is still a DHCP configuration, like it was before, but Azure knows not to assign anything but allocated “Static” IP to it. Enjoy! One thing I have noticed is that you must run Set-AzureStaticVNetIP for ALL machines in your vnet/subnet. If you have 2 machines and assign the first machine 10.0.0.4 using Set-AzureStaticVNetIP (but not the other), if both machines are turned off and the other machine is turned on, it will take the 10.0.0.4 IP. If you then try to start up the machine you assigned the IP to, it will fail. This is rather annoying! That is not my understanding. IIRC, using SetAzureStaticVNetIP and commiting changes as documented in article tells Azure to reserve the IP for the VM. It could be stopped and the IP would still not be assigned to other VMs. If you are seeing different behavior, you should talk to Microsoft support and verify if this is expected or not. There is only one scenario when I think this can happen, if you deallocate a VM from Azure portal, it can release it’s IP and it will then become available for any other VM to use. So, there is no way to confirm that the VM is running on static IP address. One of the check, is to start the server and see that the assigned IP address remains the same. It would be better if we have a command to check rather than asking to restart the server.